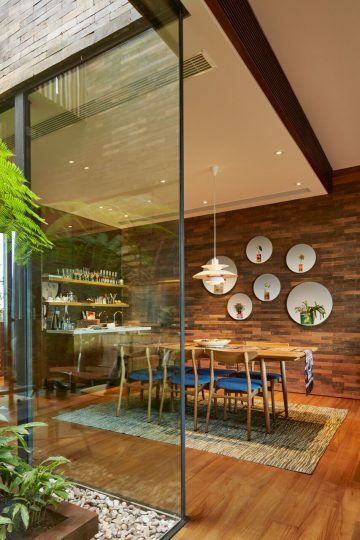 Katamama has won numerous architectural and design awards and has made its way into the hot lists of many a top global travel rags. If this is the nth summer you are travelling to Bali, consider checking into Katamama located on the hottest strip in Seminyak. 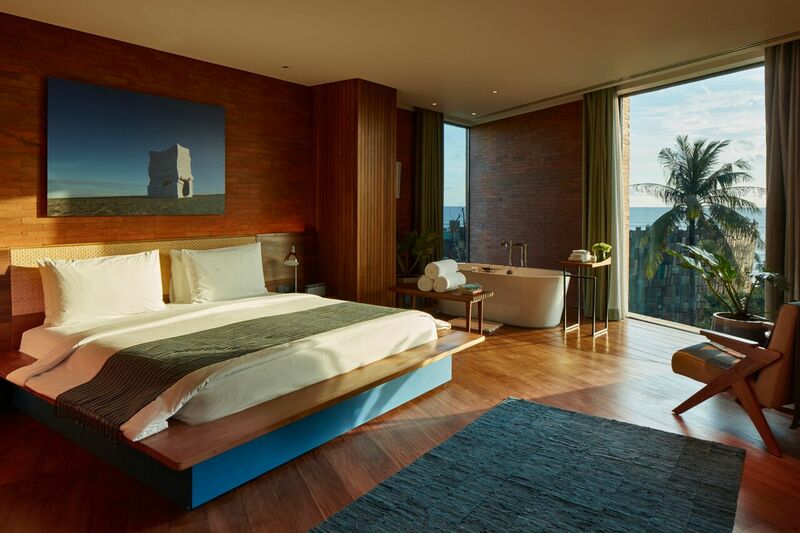 After all, you probably had enough of luxurious Balinese resorts replete with ubiquitous stone and wood sculptures. 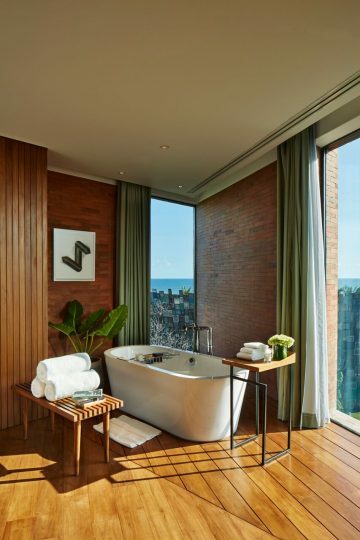 Though its design offers a refreshing change to other Bali hotels, Katamama still stays true to the host island in other ways. To pay tribute to the spiritual nature of the islanders in adapting the Balinese architectural practice of tri angga, in which spatial structure should reflect a harmony between the building and the people in it, Indonesian architect Andra Martin custom-ordered hand-pressed red Balinese bricks, usually used for holy temples. His order for Katamama was one and a half million, filling the order books of the factory in the east of Bali for a few years. More than 100 works by Indonesian artists curated by Yogyakarta’s Ark Galerie are found around property, giving it a contemporary chic ambience. 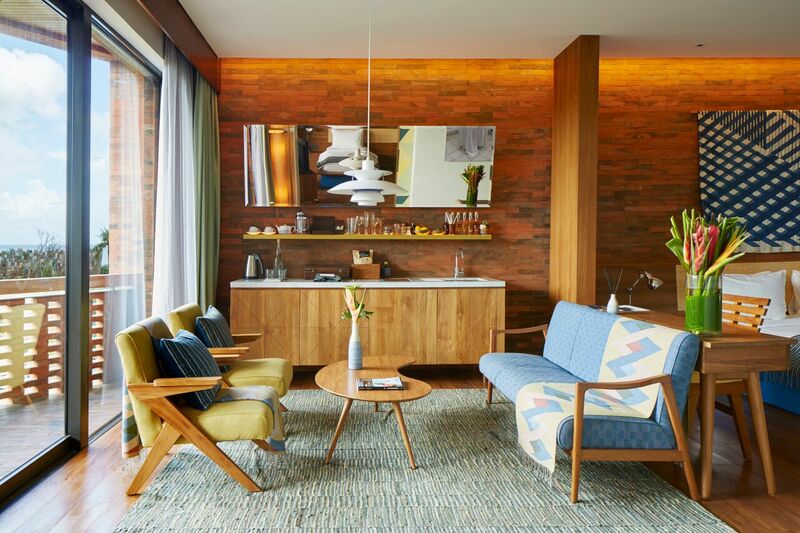 Starting at 82 sqm, the suites with Le Corbusier chairs and Louis Poulsen pendant lamps have a homey but expensive feel. Out of many winning features, my favourite was the hotel’s twist on the traditional mini bar which surprised me. It’s a real bar – complete with a variety of in-house infusions like roasted pineapple arak and vanilla tequila – to bring out your closet mixologist. However, if a professional pour of old fashioned is your choice of poison, head down to Akademi where a wide array of cocktails and infusions awaits you. The heady orange and clove infused arak (Bali’s rice based liquor) – just one of 20 in-house arak infusions, would suddenly creep up and hit you between the eyes. Beside being neighbour to Kaum, a restaurant within the same Potatohead family that specialise in recipes sourced from the vast Indonesian archipelago, passed down by Indonesian grandmothers and cooked with indigenous ingredients, Katamama also houses the first overseas outpost of MoVida, the famous tapas restaurant in Melbourne. 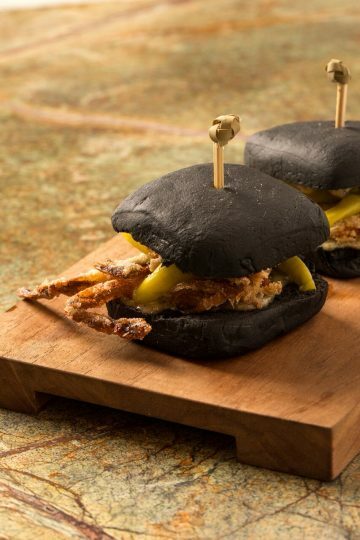 Bite into the squid ink bun with seaweed aioli soft shell crab for a punch of umami flavours.